They track all your steps and some even give you a nudge to get moving when you’ve been idle too long. You can connect with friends and family, or fitness communities, and compete in weekly challenges. For those using fitness apps like My Fitness Pal to track caloric intake, you can sync the device to your account and it will automatically make updates to the exercise portion of your journal for your convenience. You can check your progress and results, as well as set goals or create workouts, if you sync it to your smart phone and download its corresponding app. And for those who use smartwatches, you can receive notifications like calls, messages or emails directly to your phone so you don’t have to carry your phone if you choose to be phone-free. There’s a plethora of fitness trackers on the market today that can fit any budget and purpose. But how do you know which one is the right one for you? If you don’t want to spend too much, you can opt for a simple tracker – which acts like a pedometer – to count your daily steps. 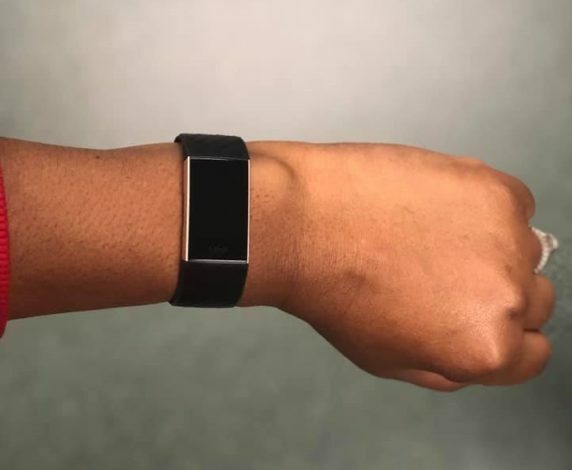 But some fitness trackers take it up a notch and provide more than just tracking steps – they offer all the little extras that elevate your experience in a big way to help you reach your health goals. Cost aside, the right fitness tracker is the one that meets your personal needs whether you want to track steps, log miles or create fitness challenges. 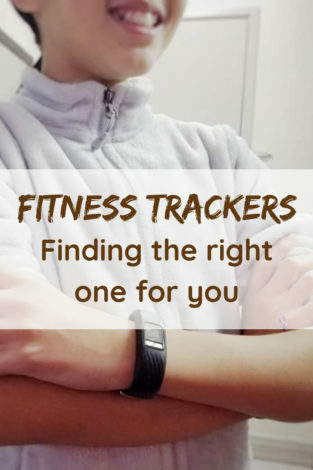 Deciding which fitness tracker to invest your hard-earned cash on can feel intimidating, but here’s a quick rundown on some of the top fitness trackers hard at work for anyone needing an extra boost in reaching your goals. Photo courtesy of Adrienne B. The Fitbit Charge 3 series is Fitbit’s most popular tracker. The Charge 3, the newest one in the series, has a simple yet sleek look that makes it versatile for the gym or outdoor activity, the office or an evening out. 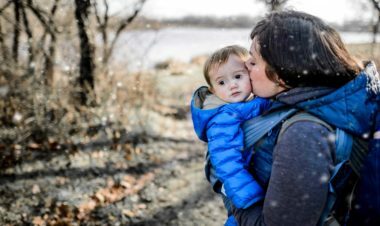 It has a larger display than its predecessor and new features like a weather widget that makes it convenient for a quick check of the weather before heading out the door. It has a single button on the side to access all the settings and is super user-friendly. The Charge 3 has 15 built-in workout options you can choose from and is easy to record your workout from start to finish with one push of the button. With a built-in heart monitor, you can quickly see your heart rate whether you’re resting or exercising. And there’s a relaxation mode that guides you through breathing exercises. As an upgrade from the previous series, the Charge 3 is also waterproof up to 50M. It’s awesome for indoor workouts like strength training and elliptical, even aerobics. You’ll get a fairly accurate calorie burn assessment due to the heart rate tracking. You still need your phone close by though if you want it to track outside via GPS. My only negative so far is that at this time, Apple users cannot use a “quick reply” feature to texts/messages that is available to those with Android phones. –Adrienne B. Photo courtesy of Becca Hosley. The Fitbit Versa is the newest smartwatch addition to the Fitbit lineup and the company’s greatest competition amongst the growing world of smartwatches. 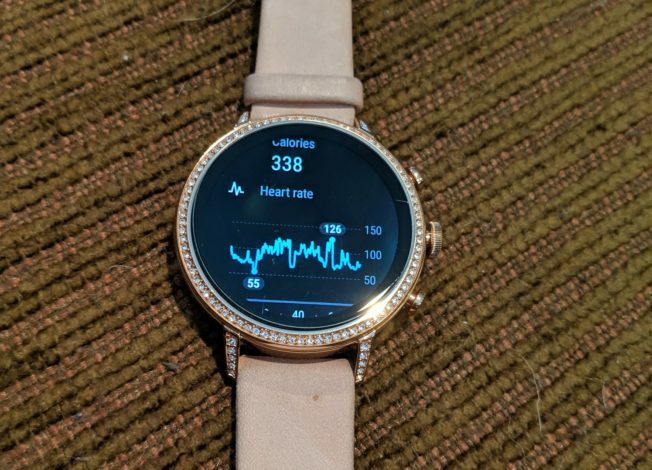 This health and fitness smartwatch lasts 4+ days on a single charge and features 24/7 heart rate monitoring, over 15 exercise modes, water resistance up to 50M, smartphone notifications, built-in sleep tracking, female health tracking, guided breathing sessions and a myriad of apps to choose from amongst other features. You can really make this watch your own with personalized reminders, customizable clock faces and tons of watch bands to choose from. The phenomenal Fitbit app for the smartphone (both android and iOS) allows you to set goals, track progress and get a more complete picture of your health and fitness all in one user-friendly app. The much lower selling price of this watch makes it an even more attractive smartwatch option for those looking to increase their health and fitness. I love the long battery life, sleep tracking and the awesome app for my smartphone. 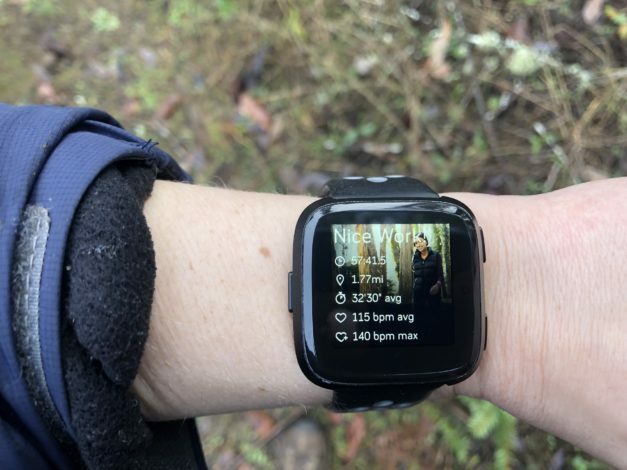 The biggest selling points for choosing the Fitbit Versa was the large, vibrant watch face that I could customize, along with the ability to get notifications from my smartphone apps and track my female health right on my watch. When I bought this watch, I didn’t want anything super complicated that would keep me glued to my watch constantly, and I didn’t want to pay an exorbitant amount for my first smartwatch. The Versa definitely fit what I wanted and needed! –Becca H.
Photo courtesy of Ryan Idryo. Fitbit’s second smartwatch is the Ionic. Besides the style, the main difference between the Versa and Ionic is that the Ionic has a built-in GPS and the Versa requires a phone to track GPS. 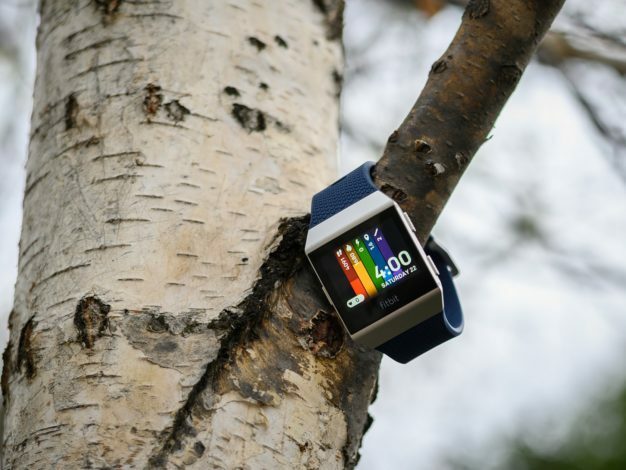 The Ionic has a longer battery life (5 days!) and is physically larger. Like the Versa, the Ionic has heart rate monitoring, is usable when swimming, tracks sleep phases, works with Bluetooth headphones, provides notifications and comes with coached workouts and breathing guidance. Some things users will find beneficial with the Ionic is that you can store hundreds of songs on the watch as well as use Fitbit Pay for quick on-the-run purchases. You can modify your watch by selecting from hundreds, if not thousands, of watch faces and add apps to customize your smartwatch to fit your needs. Fitbit also offers automatic detection of your workouts so if you forget to start your workout, it will automatically record your workout for you. Features I required were being waterproof, customizable faces and good sleep tracking. 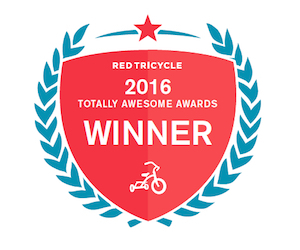 The Ionic promised automatic detection and reviews said it tracked well. After about three months, I’d agree with that. One annoyance is that it won’t give detailed information (which type of sleep) for sleeps less than three hours long. With a 3-month-old, that’s still a significant amount of my sleep. The app is nice and I found setup to be easy. I’ve heard good things about the Fitbit community, but I haven’t had a chance to look into that. I do get a weekly summary email from Fitbit which is neat. Overall, I really like it. –Ryan I. Photo courtesy of Vong Hamilton. Garmin packs a lot into the vivofit® 4 with an affordable price tag. It’s a great option for the person who wants to keep things simple while tracking the important stuff, or for the younger user who is interested in tracking steps among other things. The always-on touchscreen color display is customizable, and the slim silicone strap keeps it lightweight for the wearer but is sturdy enough that it can take a beating during a workout. It is waterproof, so you can swim, shower or continue activities in the pouring rain and it does not affect the tracker. The vivofit® 4 comes with MoveIQ, which automatically detects when a workout begins, whether it’s a walk, run or another activity, so if you forget to push the Start button, your workout will still be counted. I got this for my 12-year-old daughter who wanted to track her steps, and so far she really enjoys it. While the screen is small, the colored display is customizable and allows her to add a little motivating message for herself. I love that the battery lasts over a year so she doesn’t have to ever fuss with charging the tracker. And for an added bit of fun, we bought 10 replaceable bands of every color, so she can switch the band out to match her outfits, which makes it fun for girls her age. –Vong H.
I like having multiple apps on my tracker; besides tracking steps, it also includes a stopwatch, alarm and weather widget. I like personalizing it like changing the watch face and message. 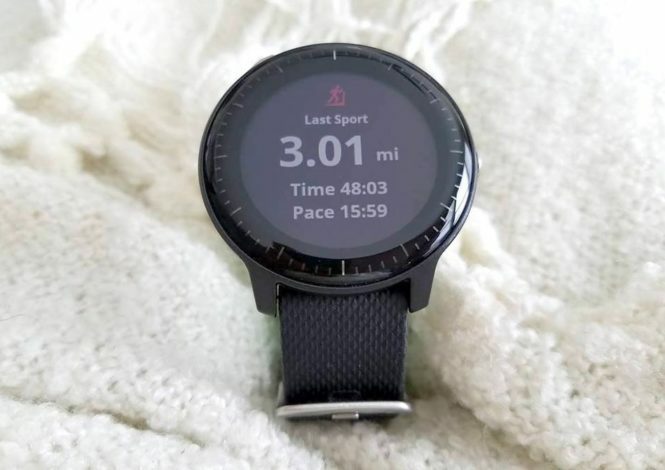 –Toccoa H.
Garmin’s latest smartwatch, the vivoactive® 3 Music, is a powerhouse on your wrist. It comes with 15 preloaded sports apps, like yoga, running, swimming, strength training, biking, golfing, or you can customize it by adding and removing those you use every day, with built-in GPS to elevate your outdoor experience. As an upgrade from the previous series, the vivoactive® 3, the Music has the added ability to store up to 500 songs so you can listen to your favorite tunes on your workouts using Bluetooth headphones. Another plus is the Garmin Pay, which adds the convenience of paying on the go without carrying your credit card on you. Just connect your watch to your card information and tap your watch on the scanner to pay. No more hiding money or credit cards in your clothes while on a long run! Customize your watch face and choose among hundreds of options from the Connect IQ store, and stretch that customization further by organizing the workout data screens with only the stats you want. 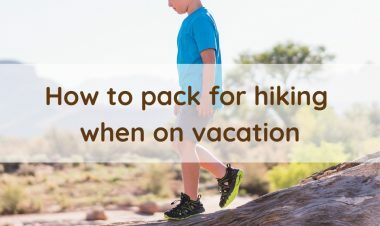 My kids and I do a lot of hiking, so I wanted to track our mileage and time we spent outside, as well as have a built-in GPS so I can conserve my phone battery and not have to sync the phone app with a separate tracker. Another useful app in addition to GPS is the smartwatch maps app that allows me to put in an address on the mobile app, sync to my watch and get turn-by-turn directions straight from my wrist. And I like the option of changing out my watch face to coincide with how I’m feeling: festive for the holidays, seasonal, fun, or just plain black for a sleeker look. The convenience of making purchases from my watch is also another plus because I prefer to be purse-free and am also notorious for misplacing my credit card because I forget which jeans or coat pocket I last hid my credit card. –Vong H.
Photo courtesy of Lexie Gritlefeld. For the “Adventurer” and music lover, the TomTom Adventurer watch is a great option for an affordable, outdoor GPS watch. The TomTom Adventurer comes with Bluetooth® headphones, holds up to 500 songs, and is able to track your adventure when you’re on the go. The GPS and barometer are capable of tracking your time, distance, and calories burned. If you’re the type of person that gets lost on hikes, this watch will help you track back your path to reduce your risk of getting lost. 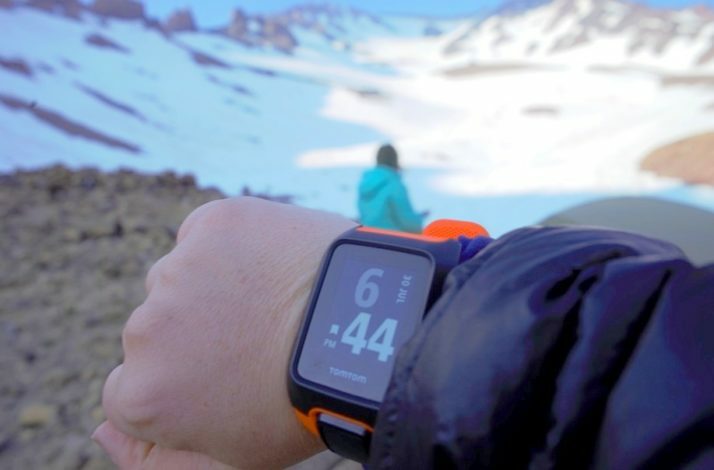 This watch includes a ski/snowboard, bike, hike, swim, and other modes for tracking your activity. It also has a built-in heart rate monitor under the watch itself. When comparing this watch to higher priced GPS watches on the market, it has all of the basic features and a little bit more for a much more affordable price. The GPS receiver also tracks you instantly, so you don’t have to wait for the signal to come through. Can you track me now? Good. Personally, I really like that you can load music onto the watch directly to use as an alternative to wasting your phone battery by playing music. As an avid skier, I also love that I can track my runs on the mountain. For a less costly watch, the TomTom Adventurer is a great option. –Lexie G.
Apple offers a remarkable two-for-one in the Apple Watch so you only need one device that has the ability to track everyday activities, while also making it convenient with its smartphone capabilities. Sync it to your iPhone and never worry about scrambling around looking for your phone again when you get an incoming call or notifications. It has GPS so you can be sure all your workouts and outdoor activities are accurate. You can also check messages and emails and listen to music from your watch without ever reaching for the phone. The Apple Watch offers a colorful touch-screen display with an easy-to-use menu you can maneuver through while swiping. It is water-resistant up to 50 meters, and the battery life is about 18-24 hours, depending on use. The newest addition to the series, the Series 4, offers a few upgrades worth noting: a slightly bigger screen, a higher tech heart sensor that can even record electrocardiograms, a faster chip which makes it two times faster than the Apple Series 3, more watch face options, and a fall detection feature that can sense if you have fallen down and are unable to get back up. The new features come with a heftier price tag, which is something to keep in mind when considering the Apple Series 3 vs. Series 4. I recently upgraded to the Apple Series 3 Smartwatch and I am in love! I am able to have multiple watch faces with different shortcuts (which Apple calls “complications”) to my most used smartphone apps. For example, I have mail, text messages, weather, and reminders on one clock face and all of my fitness app shortcuts on another clock face. All I have to do is swipe to switch between clock faces when I want to shift into fitness mode! I have also discovered that the heart rate monitor on the Apple watch is more accurate than past fitness and smartwatches I have owned. The only downfall I have encountered so far is the 1 day battery-life, though charging is fairly fast which makes up for it for the most part. After comparing the Series 3 and 4, I decided that I didn’t personally need the extra features (or the extra price tag) of the newest edition, and I haven’t regretted it! –Becca H.
Photo courtesy of Jessica Nave. Fashion meets function with the Fossil Gen 4 Venture HR smartwatch. When searching for a smartwatch, one tends to only hear about the Apple Watch. What happens if you don’t have an iPhone though? When selecting a smartwatch, I needed to explore all my options to find something that would work for me and my Google Pixel 3 phone. While I knew I wanted fitness tracking and the ability to get notifications for things like phone calls and texts I would otherwise tend to miss, looks were also important to me. I wanted a watch that looked like a piece of jewelry and not a plastic band with a box attached to it. The face offers rose gold color with some bling accents. The Fossil Gen 4 Venture uses Wear OS by Google. 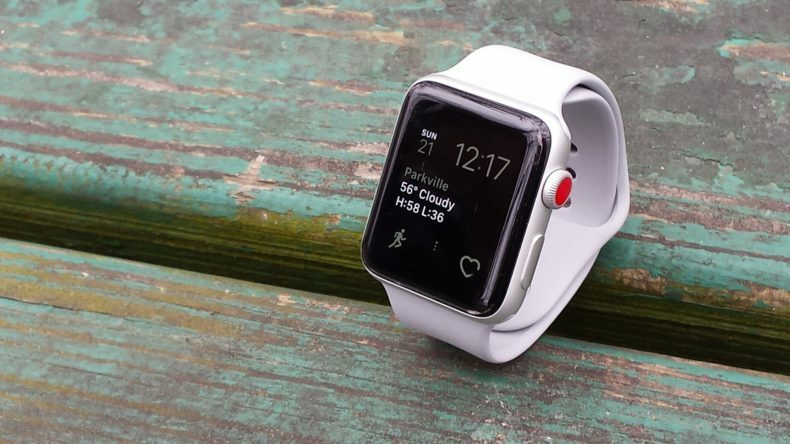 It includes heart rate tracking, GPS, Google Pay, Bluetooth connectivity, app notifications, the ability to listen to music (via bluetooth headphones) and an interchangeable watch band, which is also comfortable to wear for workouts. My favorite feature is the Fit Workout feature, which allows you select a workout. As you work out, the watch tracks your calories burned, move minutes, and a graph showing your heartrate during the workout. Overall, I’m pleased with the watch and love its ability to transition from fashionable watch at work to fitness tracking afterwards. It does need to be charged daily, but otherwise checked all the wants off my list. –Jessica N.
Photo courtesy of Clay Abney. The Suunto Spartan Sport Wrist HR is one of several models within the Spartan Collection. Designed and handcrafted in Finland, the Sport Wrist HR is a great option for weekend warriors to die-hard adventure addicts and multisport enthusiasts. 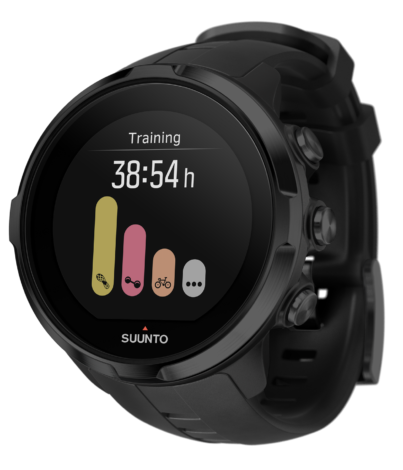 While providing most (if not all) of the same features that are available in the many of the activity trackers, the Suunto option sets itself apart from the field with over 80 sport modes, GPS navigation, and water-resistant to 100 meters. 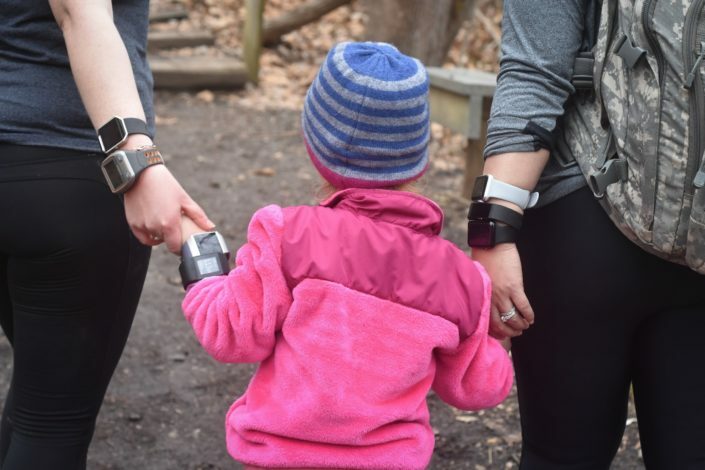 Some of the more common features include estimated wrist heart rate (for more accurate heart rate assessment, an optional heart rate belt is available for an additional fee) and sleep tracking. Unlike other activity tracker models, the Suunto line is designed to endure the most demanding conditions and environments. Pair with the Suunto app to keep track of all of your activities. I have been using Suunto watches for more than a decade and have utilized them from indoor spin classes to multi-day adventure races. 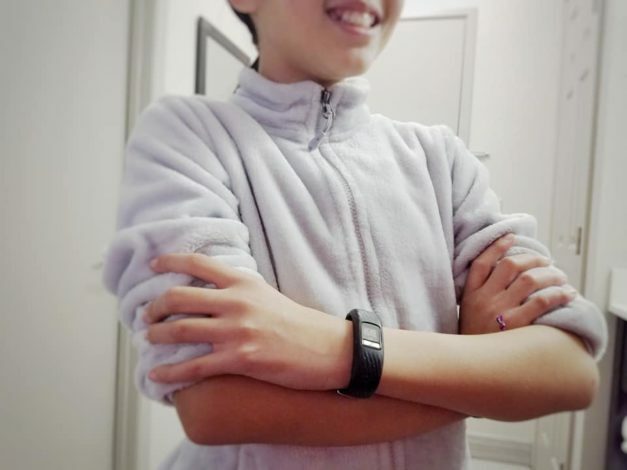 While I have tested other activity trackers within this same time period, I have always returned to the reliability that I have come to expect from the brand. They have endured adventures from Greenland to Antarctica and everything in between. –Clay A. Featured photo by Vong Hamilton. Do you also use a fitness tracker or smartwatch to help keep you accountable in your health and fitness goals? Share what you love about your tracker and the ways you use it with us below. Gear Apple watch, Fitbit, fitness tracker, garmin, TomTom runner. permalink.